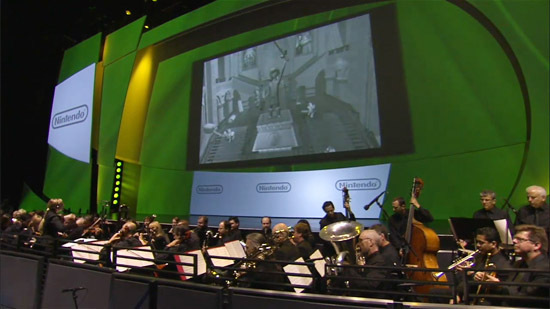 A few months ago when the Zelda Symphony Concert was first announced we soon found out that there will be dates in both London and Los Angelos. We haven’t gotten any other definite locations yet, but we do know that Nintendo has a nation-wide tour planned in 2012. What about the rest of the world? Nintendo of Australia has setup a mini-site dedicated to the 25th anniversary and it is similar to that of the European and American versions of the website. The notable differences with the site is that there is no image button for the Orchestral Concert Tour and some buttons are re-arranged on the site. Also, there is no link for Link’s Awakening DX on the Nintendo 3DS eShop, but instead there are links to the Australian pages for Phantom Hourglass, Spirit Tracks, and Twilight Princess. The anniversary page does have the same links to the history page, flipnote contest, and downloadable wallpapers. 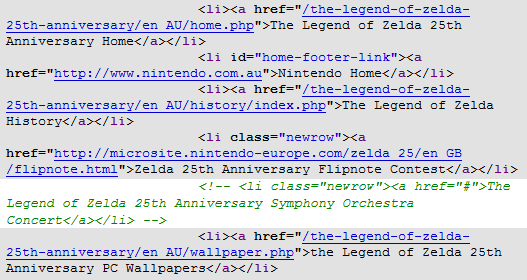 The Australian site does have a few text links at the bottom of the page and if we look closely at the source code for these, we see something that catches our eye. The highlighted part in green text seems to indicate that there will be a text link in the footer of the webpage eventually. However, the current coding makes it so that none of this displays at all on the page for the viewer. So in basic terms, they have already prepared coding and will need to just make tiny changes once the link is up. Does this mean that the concert tour is coming to Australia? Well, it sure seems like whoever designed the website surely thinks so. Unfortunately it is still a waiting game as there hasn’t been any word from Nintendo themselves. Be sure to check back for all the latest on tour dates for the Symphony Concert.